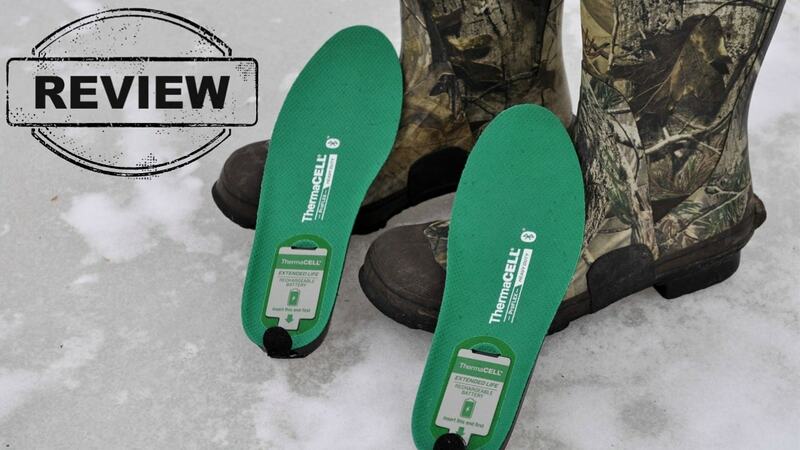 Best Heated Insoles for Hunting – Stay Warm This Year! When hunting season starts to get cold this year make sure your feet can stay warm and comfortable with heated insoles. Whether you spend your time at a stand waiting for the game to come to you or trekking out after it, you’ve experienced cold feet. Now, there is no reason for that, you can find the best heated insoles that will fit perfectly with your hunting plans this year. How Do Heated Insoles Work? Heated insoles have a built-in heating element that lives in the front of the insole while a rechargeable lithium-ion battery for charging lives in the heel. Most of these products are remote controlled and come with a wireless power remote that allows for easy heat control. There are some models that are size specific, but many come in universal sizing which allows you to trim them to fit your shoes perfectly. There are certain aspects to heated insoles that can make them stand out from the competition or fade away. Here are some things to keep in mind while searching for the best pair for you. Some have built-in lithium-ion batteries that come with charging cords that you attach to the heel when charging is needed. Others have external battery packs that need to be attached to the outside of your shoe. Heated insoles are great until you must repeatedly remove your shoes to turn them on and off. Look for ones that come with a wireless remote that controls the heat. If you are going to be walking around a lot, you need insoles that are comfortable and fit well. They typically come both in specific and universal sizes. Keep in mind that you can trim universal sizes to match the current insoles of your shoes for a near perfect fit. 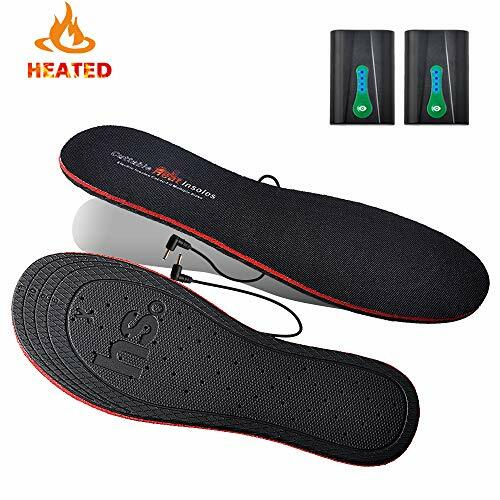 The main features of heated insoles that can make or break it for the buyer are, how easy it is to turn them on, how long the batteries will last, and lastly, how comfortable they are. The batteries that last longer give you warmth for long hiking or hunting trips. While on these trips you also need the insoles to be comfortable so that you are not experiencing discomfort while using them. It would also be best if you don’t have to repeatedly remove your shoes to turn them on and off, or to adjust the temperature. These insoles have four different temperature settings to allow for perfect comfort in any temperature. The rechargeable battery can be charged up to 500 times so that you can use them for many winters without having to buy new batteries. The batteries are also efficient allowing for about 20 hours of use at the lowest heat setting. The Hotronics are also universally-sized, enabling you to trim down the product so it fits perfectly in your boots. These are durable and textured on the bottom to ensure that they do not slip around inside your shoes while you are walking, causing discomfort and possible blisters. The Hotronic Footwarmer S4 Universal is definitely a great choice to keep your feet warm, whether you’re hunting, hiking, or just get cold feet easily. No matter the reason, these will do the trick to warm you up. Built to last with rechargeable batteries that last up to 20 hours and sizing that is adjustable for anyone, these are the best overall product that you can find. The only apparent downside is that you have to attach the battery pack which controls the temperature to the outside of your boot. 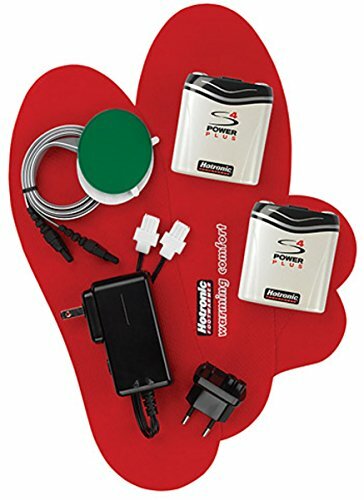 While this can be harder to use if you are wearing regular shoes that do not have tall ankles, the battery pack attachment is not a big drawback on the overall quality of this product Overall, the Hotronic Footwarmer S4 Universal is an excellent product that will not disappoint consumers. These insoles are the equivalent of hand warmer packets for feet. The Hothands Insole Footwarmers are very easy to use and just as easy to dispose of. This product must be shaken to activate and will take anywhere from 15 to 30 minutes for them to heat up fully. As they are made without any harmful chemicals or electric parts they can easily be disposed of in the trash. The Hothands Insole Footwarmers are an excellent choice for someone who doesn’t want to deal with wires and batteries. They are very convenient also for people who don’t need to use footwarmers constantly. These are easy to activate by shaking and will give you heat for up to nine hours. They are thin and won’t take up too much space in your boots, leaving your feet enough room to remain comfortable. If you are also a bit of a germaphobe, these are perfect for you, as they can only be used once so you don’t have to reuse insoles that have been sitting in your shoes all day. While you do have to throw them away after a single use, this can be a con or a pro depending on how you are intending on using them. As they normally come in a pack of 16 pairs, it is useful for keeping them only for specific times such as when you are planning to go hunting or hiking in the cold weather. 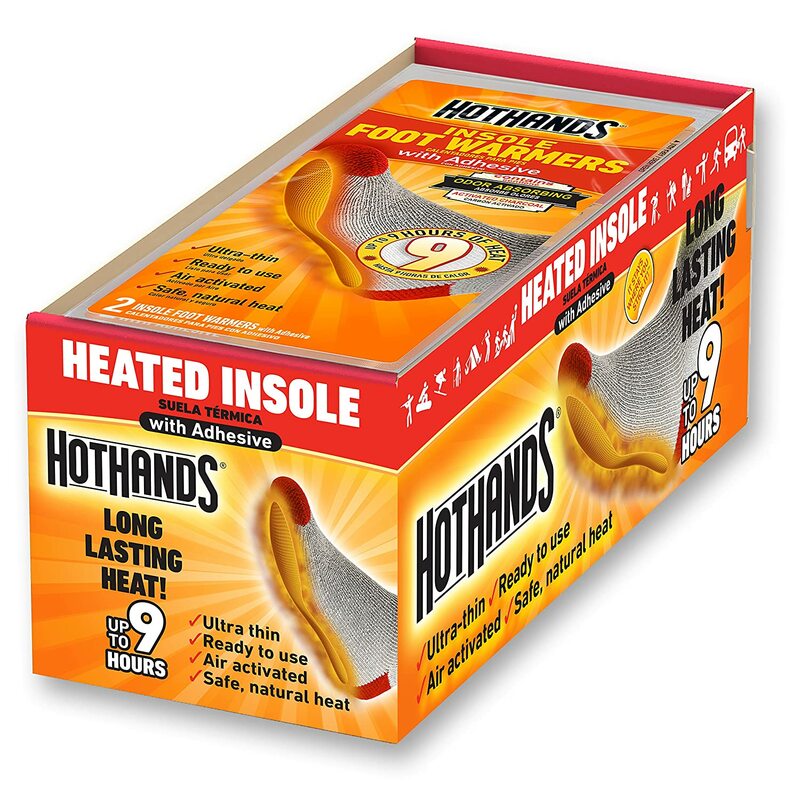 If you need heated insoles sparingly, the Hothands Insole Footwarmers are the best choice for you. These are well made, with a hard-bottom sole that has a chart on it to assist in cutting for size. They have three different temperature settings that are controlled by wireless remote control, so there are not battery pack attachments or cords that have to stick out of your shoes. They are powered by lithium-ion batteries that can be recharged up to 500 times. The Rechargeable Heated Insole Footwarmers for Hunting are a great choice if you are looking for something that you can use many times and have easy control of. They have a heating element in the ball of the insole and a chart that shows where you can cut to adjust the size without damaging the heating element. The heating element is controlled by remote control so that you can easily change between three different heat settings and turn them on and off. Along with the ease of controlling these insoles, they are just as easy to recharge. They come with a USB charging cord and can be fully charged in three to four hours, depending on how much battery power is left. The batteries can be recharged up to 500 times so that you can enjoy perfectly toasty toes for lots of winter days and many hunting trips without having to replace them. The only possible issue is the care of them. When cleaning them you must be careful to only wipe off the top so as not to damage the battery charging port on the back of the heel. 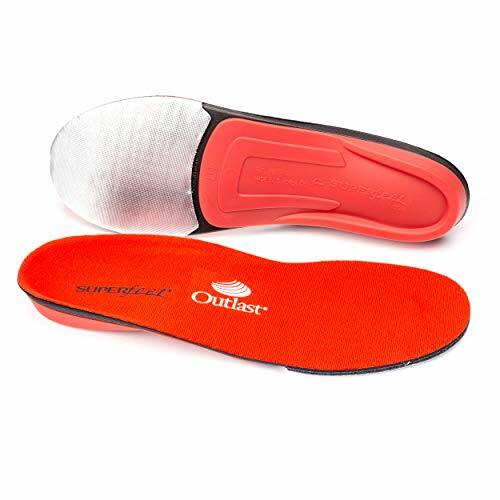 Overall, these insoles are an excellent choice for many uses and convenience. These heated insoles include rechargeable batteries that attach to an ankle strap for easy temperature control. The batteries are charged by a power adaptor that plugs into an outlet on one end and has a split cable to charge each battery at the same time. They come in three general sizes for both men and women. These are made to be comfortable and to prevent slipping inside your shoes. The bottom is a gripping material so that you can walk and climb comfortably without worrying about the insoles moving or sliding. These Heated Insoles with Rechargeable Battery are an excellent choice if you are looking for a product that will provide ultimate comfort and convenience. The different sizes allow you to choose the size you need and are built to prevent slipping in your shoes. This keeps you free to walk, run, and climb as you normally would without having poorly built insoles slipping around in your shoes. It is convenient and easy to control the temperature with the battery attached to your ankles by a Velcro strap. It is also easy to charge the batteries wherever you are by just plugging the batteries into the power adaptor. The only con may be that depending on the temperature you desire, it may affect how long the battery lasts. Overall, these are a great option if you move around a lot on uneven terrain and need to be able to easily control the temperature of your insoles. These insoles are built to give support and comfort for all-day use. The heel is made of hard plastic with foam inside to cushion your foot. There is supportive orthotic foam to give arch support as well as comfort for your toes. The tops are treated with Outlast adaptive comfort so that it absorbs, regulates, and reflects heat to your feet. The bottom has a foil cover to deflect cold from coming in through the bottom of your shoes. The Superfeet Redhot Insoles for Ski, Snowboard, and Snow Sports are an excellent choice if you are looking to use your insoles more for mostly hiking. These were built to fit best in ski or snowboarding boots as they provide extra support and comfort for your heel, however, they can be used in hiking boots as well. They use simple reflective heat technology to recirculate the heat that your feet make and deflect the cold from outside your shoes with a foil bottom. This technology means that there are no wires, batteries, or controllers that you need to have to use these insoles. This is very convenient as it means that you don’t have to worry about replacing batteries or wire coverings wearing down, however, it does mean that you don’t have specific control over how warm they get. These insoles come with two rechargeable lithium-ion batteries which you can remove from them for extra ease while charging. They are durable and well-padded which might make your shoes a bit tight at first but will change after you have worn them for a while. They are controlled by an app that you install on your smartphone and then you can turn them off and on by using Bluetooth. This app also allows you to see the remaining battery life. 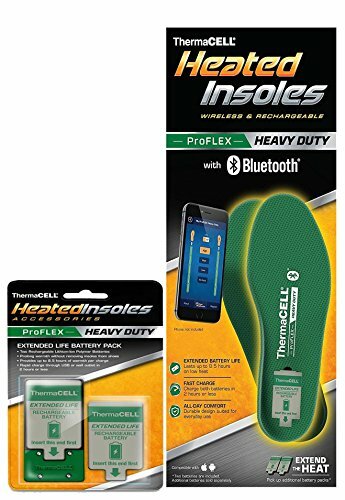 The ThermaCELL Proflex Heavy Duty Heated Shoe Insoles are a great choice with the ease of use and durability that they provide. The insoles have a sturdy sole and foam top to provide comfort for all day use. The lithium-ion batteries can be recharged in two hours or less and provide up to 8.5 hours of warmth on the lowest heat setting. The most popular feature of these insoles is that they have Bluetooth compatibility and you can control the temperature and monitor battery life from your phone with the app that connects them. This is also the feature that can cause problems due to issues with keeping the insoles connected to your phone. Overall, these insoles are an excellent option for someone who likes the use of easy technology and enjoys keeping their feet warm for a while during hunting or hiking trips. Now it is time to think about the perks of picking a great pair of heated insoles. This is one of the main things to consider when you are shopping for insoles, whether they are heated or not. You need to make sure that you have a pair that fits properly in the shoes you will be wearing and isn’t horribly bulky with the heating element that can cause you discomfort while wearing them. Next is how long with your insoles last and will continue to keep your feet warm. You need to have insoles that will still give you support and warmth even after using them for many hunting, hiking, or just outings in the cold weather. Lastly is how easy your insoles are to control. If you have to continually take off your shoes to change the temperature or turn them on or off you can waste precious time that could have been used in stalking game or exploring a cool new place. No matter what you are going to use your heated insoles for, you need to make sure that you are getting the pair that is right for you. Keep in mind how often you are going to be using your insoles and how you will need to control with them to adjust the temperature and comfort. Luckily, there are many excellent options for you to choose from to get the perfect pair.